Somon Air, Tajikistan’s first private airline and, currently, the country’s leading carrier, will launch services to two new countries in its summer schedule. The carrier will commence flights on the Dushanbe-Kabul route (around 400 km to the south) on 29 April; on the same day, Somon Air will inaugurate a service to Lahore, Pakistan (some 920 km southeast of Dushanbe). These two new destinations will expand Somon Air’s international scheduled route network to a total of eight countries. With its weekly Wednesday return flight to Kabul, the airline will compete against Afghanistan’s Kam Air. The route is particularly popular with Afghan nationals living or studying in Tajikistan, and also with transit passengers, the carrier’s press secretary Timur Bandishoyev says. The Lahore flight is a new Tajikistan-Pakistan route, and Somon Air for the time being will remain the only operator for these city pairs. Bandishoyev says Pakistani business travelers would previously have to spend a lot of money and nearly 24 hours on connection flights via Dubai. The carrier will operate two-daily flights between Dushanbe and Lahore, on Mondays and Fridays. Bandishoyev says that both Tajik tourists and businesspeople are interested in the establishment of an air route to Lahore: “Pakistan is known for its affordable high-quality cotton, leather and jewelry”. Russia currently has no direct air services with Afghanistan or Pakistan. Somon Air’s initiative might make these two countries more accessible to Russian citizens. 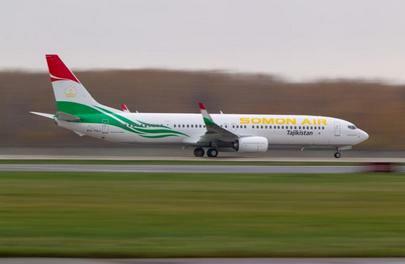 Somon Air is expected to put Boeing 737-800s on its services to Afghanistan and Pakistan. The carrier operates two of the type, as well as two Boeing 737-300s and two Boeing 737-900s. The airline flies to Russia, Germany, China, the UAE, Turkey, and Kazakhstan. The airline is planning to start flying to Tehran later this year. Privately-owned Somon Air carried 477,000 passengers in 2015 (down 16% from 2014), and still leads the Tajik air carrier rating.